WOLTERS KLUWER KFT. , Megjelenés: 2016. június 17. In 2012 the Hungarian Academy of Sciences established the Media Studies Research Group for the management of various social scientific research activities related to the media. Activities related to media law are of paramount importance among these, not least because of the rapid and major changes taking place in the field of media regulations, the many open questions that arise both on the national and the European level and the disputes related to the media regulations. The Academy hopes that this initiative will enable the research team to conduct studies that are significant on a European scale, as well as to participate in international exchanges related to the subject. The Academy invited distinguished scholars from many countries working in the field of media and free speech law to take part in the research programme and to send manuscripts for a planned publication of a collection of essays. The participation of diverse authors from various countries and backgrounds has greatly contributed to the value of the research. This book is composed of six larger structural units dealing with (1) the fundamental theoretical questions of freedom of the press, (2) the regulation of new media, (3) the legal status of journalists, (4) the means available to the European Union to safeguard and regulate freedom of the press, as well as the eternal, fundamental questions of freedom of speech, (5) the law on defamation and the protection of privacy, and lastly, (6) the limitation of hate speech, including the problems related to blasphemy and "denial laws". Since the authors come from numerous different countries, their viewpoints are also quite diverse and multifaceted. The texts address the most topical and important issues of media regulation and freedom of speech. Freedom of the press and media regulation in democratic countries, by their nature, cannot be static, but are constantly changing. Still, a book such as this one must be closed and delivered to the readers at some point. Nevertheless, conclusions drawn in these studies will defy time and remain valid for a long time. 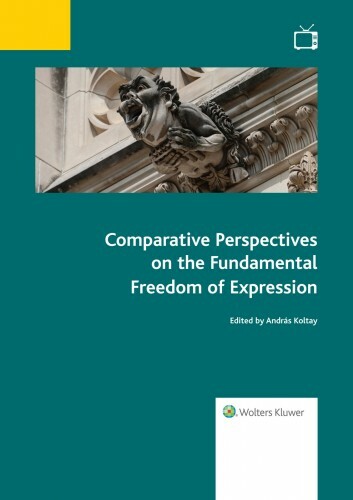 These writings not only keep for posterity a specific part of the current scholarly standpoints and record a snapshot of the cross-section of current press freedom-related issues, but also they can even actively form scholarly and public thinking about these questions. They will prove to be a great source for international readers, such as researchers, university students and media policy decision-makers, who areinterested in the legal aspects of freedom of the press.